"Today, Christian endeavor in the arts is typified by the contents of your local Christian bookstore-accessories-paraphernalia shop. For the coffee table we have a set of praying hands made out of some sort of pressed muck. Christian posters are ready to adorn your walls with suitable Christian graffiti to sanctify them and make them a justifiable expense. Perhaps a little plastic cube with a mustard seed entombed within to boost your understanding of faith. And as if this were not enough, a toothbrush with a Bible verse stamped on its plastic handle. And a comb with a Christian slogan or two impressed on it. On a flimsy rack are stacked a pile of records. You may choose them at random blindfolded, for most of them will be the same idle rehash of acceptable spiritual slogans, endlessly recycled as pablum for the tone-deaf, television-softened brains of our present day Christians."pg. 22-23...Hilarious. I found this book to be very encouraging in the freedom it gives Christians to pursue their artistic endeavors in their own special way, without being held back by suffocating "Christian" ideologies. It begins with an argument for many of the problems with the way the Evangelical American church has handled the arena of the arts and aesthetics, and then gives an alternative solution for how one could view the arts. All while taking refuge and inspiration from the history of Christian artists going back to the fall of the Roman Empire, heightening in the High Renaissance, and finally through the 19th Century. First, I LOVE Francis Schaeffer's books and worldview. I have yet to read anything I don't like by him. This has been on my to read list since college and I'm glad I finally read it.I think it will be a book I read and re-read. There is much wisdom in this tiny little book. Some of my favorite quotes were:1. Art needs no justification.2. Christians should add to integrity and quality in all areas of art.3. Christ redeems our work (art).4. (paraphrased) There is no need for slogans, propoganda, or Christianeese in art. (Or in any other aspect of Church life that uses artistic ability).5. Everything (art) is His (God's) whether the art is Christian or secular (paraphrase mine).Basicall, Schaeffer once again argues that the Church needs to change its view of art (thus those who have the gift/call of art) dramatically. And not just 'christian' art, but any kind of art. He argues that in the end, all art is 'Christian' because all art comes from Him who is the greatest creator of all. Being an artist is as close as you can get to God in a sense because you are creating which is what God does/did.One of the things Schaeffer repeatedly talks about is how Christians should be setting the standard of art - not mimicing the world's standards, nor, bending to the demands of the church structure on what they define 'art' to be or what they kind of art they even allow.Artists need to create whatever it is that they 'see' and 'desire' to create. My favorite part was Schaeffer's confirmation that being creative, being an artist is a gift from God and when the church or other Christians squelch that, change that, or filter that, that is not of God.One of the comments Schaeffer makes that really had me nodding my head was that whatever we are called to do, be it acting, writing, being a businessman, THAT is are 'art' and we should do it with gusto, integrity, and high standards. In addition, going to that job is living a Godly life which is a our Christian duty. We don't have to be in church teaching, singing,doing missions, or doing anything else to fulfill our call of being a Christian. The term is all encompassing and being at work is part of that. Be in the world... It is not fulfilling the traditional demands of the church that makes us Christ follower/Christians but it is our actions out in the midst of the world doing what we have been called to do and gifted to do. So, at home, at church, or at work are all part of our fulfilling our call; our purpose.Excellent book! Highly recommend it. Now off to find some more of his books to read. 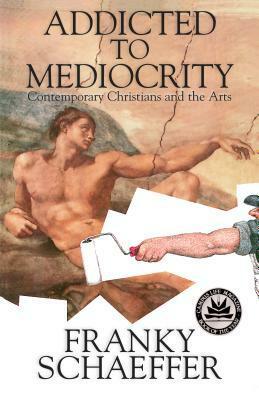 Franky Schaeffer lambastes the 20th century church's lack of regard for the arts and "addiction to mediocrity." He is fed up with the cheap baubles with verses slapped on them, the trite bumper stickers with vaguely Christian sayings, the posters that amount to little more than Christian graffiti, the "shallow" "redundant" "sloganeering" books/preaching, etc. that fill Christian bookstores, churches, and homes.The basic argument of the books is:- Creativity is an aspect of the image of God in man which should be exercised and encouraged.- Beauty (as something created by God) should be appreciated whether the source or subject matter is overtly Christian or not. - The Christian life should not be compartmentalized into "spiritual" and "secular" activities; rather, every part of life should be to the glory of God (with this book focusing on excellence in the arts).While I agree with Schaeffer up to a point, I think that in his zeal to promote quality in the arts among Christians (a worthy goal!) he takes his arguments too far and/or overstates his case. For example, he seems to make the unwarranted leap from the idea that all parts of a Christian's life are of value and should be to the glory of God (true according to I Corinthians 10:31) to the idea that all parts of the Christian life are of equal value/importance (contra e.g. Luke 10:38-42).I also thought that Schaeffer comes across as mean-spirited, or even pompous at times. For example: "in [the arts]...the Christian community, the evangelical establishment, often exhibit to the world an I.Q. about thirty points lower than that of a rather demented jellyfish". Funny? Yes. Demonstrative of Christian love? Not so much. I do not think that he makes any non-disparaging remarks about the church in the entire book.I agree with the aim of this book and some of its main points, but I think that it would have benefited from less venom and more Scriptural support. A short and easy ready (little over 100 pages) by the son of Francis Schaffer, written in the early 1980's. The core of the book is: (1) A challenge to Christians to stop settling for mediocre art simply because it has a Jesus sticker or Christian slogan on it, (2) a challenge to churches to start supporting Christian artists better with whatever they want to make, whether it be suitably "Christian" or not, and (3) a challenge to Christians who are artists to make good art and not compromise their artistic vision or integrity. This was mostly preaching to the choir for me, so I am biased to like it.The book is more than the core, including a second half that is mostly a Q&A based on questions the author received doing a speaking tour about these concepts, and also various other thoughts about art such as developing art appreciation, whether there is a difference between Christian and non-Christian/secular (he says no--the Earth is all of God's creation), and some theological arguments for valuing creativity in all sorts of life paths. I was going to give this "book" (more of an extended pamphlet) three stars, but the pretentious and mean-spirited tone of the author made me lose an interest in reading his Q&A section, which makes up the second half of this edition. While Schaeffer does point out some truth about the decline of art in the last century and while he makes some compelling arguments for why this is the case, he makes little progress in recognizing the existence of good Christian art and fails to offer many suggestions for improving the Christan arts other than "just do it" and "use your money to buy better things. "This may have been a revolutionary book for its time, but his scathing attack on the "mediocrity" of the church has not held up in the last few decades. Fortunately, we now live in an era of artistic resurgence, rendering "shocking," church-bashing books like this irrelevant. I like that Franky doesn't just bash Christians' lack of quality in the arts (although he does do that too), but really draws a line in the sand about Quality in general. (Up for a Chataqua, anyone?) A few gems stuck with me, like his take on believers being called TO something. What is it? Is it sheep to call other sheep, or is it enjoyment in the life and creativity we are given? He sometimes goes a bit pendulum-swingy (yes, it's an adjective) extreme with how much he downplays the importance of preaching and the church, but I like the concept of work and creativity and family being just as valid as missions and ministry. I almost gave this one 3 stars, but I think there was enough truth in it to warrant 4... Not exactly the most beautifully written book and the author sometimes sounds as if he has a bit of a chip on his shoulder. It was encouraging, though, and definitely worth a read for a Christian who is involved in art. Frank Schaeffer Kurt Mitchell - Frank Schaeffer is a New York Times bestselling author of more than a dozen books. Frank is a survivor of both polio and an evangelical/fundamentalist childhood, an acclaimed writer who overcame severe dyslexia, a home-schooled and self-taught documentary movie director, a feature film director of four low budget Hollywood features Frank has described as “pretty terrible.” He is also an acclaimed author of both fiction and nonfiction and an artist with a loyal following of international collectors who own many of his oil paintings. Frank has been a frequent guest on the Rachel Maddow Show on NBC, has appeared on Oprah, been interviewed by Terri Gross on NPR’s Fresh Air and appeared on the Today Show, BBC News and many other media outlets. He is a much sought after speaker and has lectured at a wide range of venues from Harvard’s Kennedy School to the Hammer Museum/UCLA, Princeton University, Riverside Church Cathedral, DePaul University and the Kansas City Public Library.